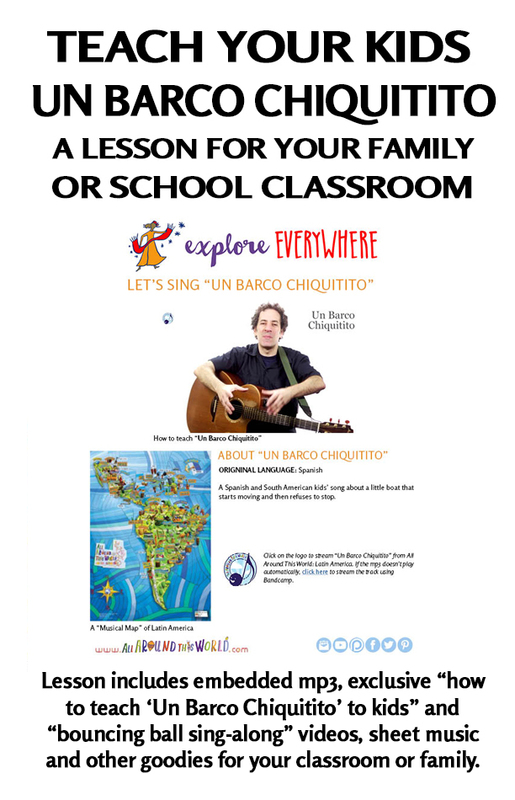 “Barco chiquitito” is a Spanish song about a boat — a fantastic little boat, in our opinion. There are several versions of this song, but in the most widely sung, there is a little boat that can’t set sail for seven weeks, during which time provisions start to run out. In one translation, crew members get so hungry they eat their boots “with red sauce and a walnut,” get very sick and have to turn back. While our version is still a Spanish song about a boat, we not only let the ship sail, but say that it’s unable to stop sailing, then we also sing about an airplane that can’t stop flying, and, in class, we go through other modes of transport and say they can’t stop going either (a car, a bicycle, a pogo stick….). Que no podia, no podia, no podia parar. And it could, and it could, and it could not stop. Drums, keyboard and bass engineered and co-produced by Mark Wolfe at Audio Mind. Listen to an original version performed by Octavio Corvalan on the Smithsonian Folkways release, "Vamos a Cantar: Let Us Sing: A Collection of Children's Songs in Spanish."